This year marks the 15th anniversary of the Mario Tennis series, with the original gracing the Nintendo 64 back in 2000. On the console side, the sequel would later hit the GameCube in 2004. The Wii only received a remake of the GameCube version, which is especially odd considering that motion controls would seem like a perfect reason for an all-new iteration. 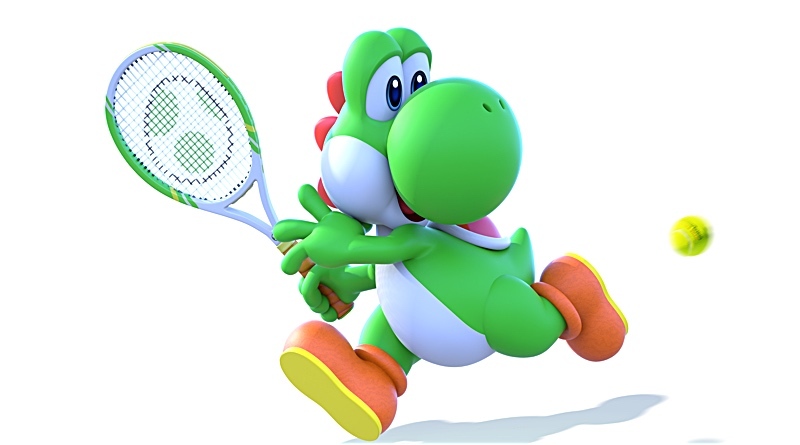 So, not counting the remake, Mario Tennis Ultra Smash is only the third outing in the franchise, and the first with HD graphics. At least it has that going for it. Creating a sequel to a popular franchise has inherent benefits, such as: an established fan base, a gameplay structure to improve upon, and familiar characters and settings. It can also come with baggage and hurdles that need to be overcome, like: surpassing expectations set by prior games, introducing new and exciting mechanics, and evolving with the times to remain relevant. Some series, like the mainline Mario games, have managed to reinvent themselves time and time again, creating new and exciting experiences for veteran fans as well as newcomers. 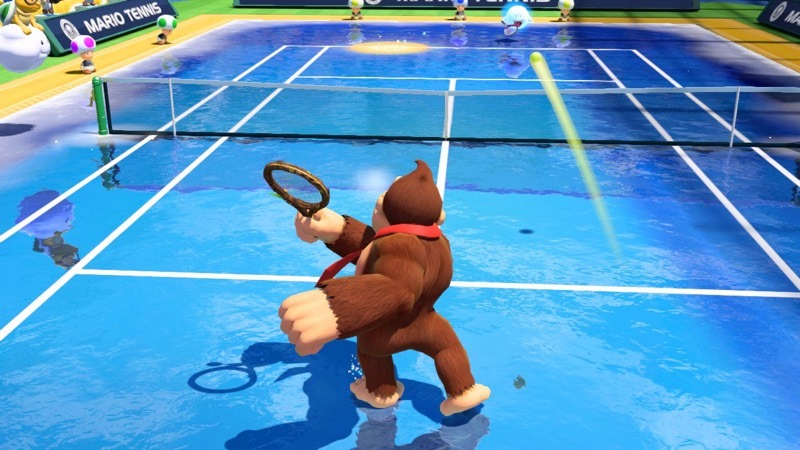 Unfortunately, Mario Tennis Ultra Smash fails to move the series forward in any meaningful way, instead removing many of the features and nuances that made the first two console games so memorable. I’m going to start out positive and then dig into the problems later. 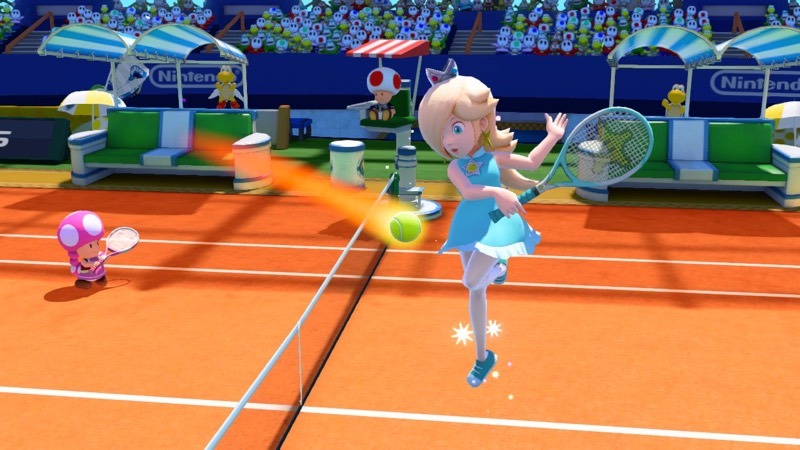 Mario Tennis Ultra Smash is visually appealing. It doesn’t look as detailed as Super Smash Bros. or Mario Kart 8, but the bright and colorful graphics and solid animations really do bring this game to life. Little touches like the crowd going wild and turning over cards to form a big picture of the winning team is great to see, and many of the replays showcase the breadth of emotions each character has, whether winning or losing. The game really shines when playing multiplayer, especially with friends in the same room. The game supports up to four players at a time, and the craziness of the matches is sure to keep the trash talk flowing throughout. This is clearly where the game excels and the sweet spot for getting the most out of it. If you often have get-togethers with friends or family, it will provide hours of entertainment with its solid controls and appealing graphics. Plus, it doesn’t hurt that it’s actually a competent tennis game, which can be played with or without the Mega Mushroom (more on that in a moment). One more nice touch is that the Game Pad can be used as the screen for one player while the other gets the TV, giving both players the best vantage point for his or her character. After a few rounds of play, it quickly becomes apparent that Mario Tennis Ultra Smash is lacking in many areas. First up, although the online mode is a welcome addition to the console version of the series, it doesn’t stack up to the features found in other titles. It allow for one or two people on a system to connect online and battle it out with random strangers. While this may satisfy some people, it’s pretty barebones and becomes old-hat very fast. The lack of joining up and playing with friends online is a staggering oversight that just boggles my mind. I don’t understand why other games released by Nintendo can have fully fleshed-out online experiences, while this one makes a half-hearted attempt at remaining relevant in the 21st century. 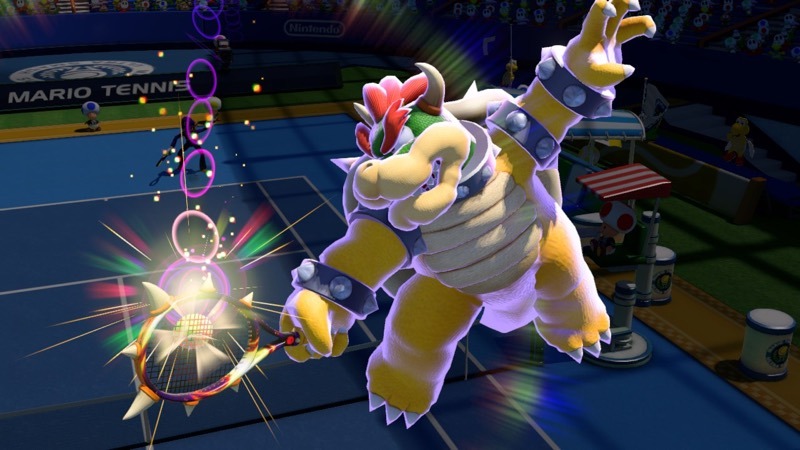 The most egregious problem with Mario Tennis Ultra Smash is its lack of soul. The presentation comes across sterile and the experience feels phoned-in. Prior versions have been bristling with a wide variety of courts to play on, many of which had their own twists and gimmicks. Why are we relegated to boring stadiums with no hint of the Mushroom Kingdom? Previous games had awesome locales, like Luigi’s Mansion, Peach’s Castle, Bowser’s lair, to name a few. On top of that, the GameCube version had amazing remixed soundtracks from many of the past Mario games that really helped sell the experience. None of that is in this game. Imagine if the next Smash Bros. didn’t feature any recognizable levels or music and instead had you battling it out in some generic universe. Or, if the next Mario Kart was completely devoid of the Mushroom Kingdom and had you racing on the courses from Gran Turismo. It just doesn’t make sense, and it’s a shame that Ultra Smash fails to embrace the rich heritage of Nintendo that is simply there for the taking. Speaking of failures, what happened to the variety of modes to play that were present in the prior titles? There isn’t much to choose from here: Mega Battle, Classic Tennis, Knockout Challenge, Mega Ball Rally, and Online. Mega Battle and Classic Tennis are pretty much identical, except the first one adds in random Mega Mushrooms, allowing your character to grow supersize for a brief time. All this does is allow him or her to hit the ball harder, causing opponents to get pushed backward a bit. It adds very little to the game, and is a far cry from past experiences where the power-ups were more fun and randomized, creating more chaotic matches. Course hazards are gone (unless you count the unlockable ice court) and the lack of venues only adds to the tedium. Mega Ball Rally is a throwaway mode that I became bored with almost immediately. Here, you attempt to keep a volley going for as long as you can. This can be a little enjoyable with a second player, but single player is downright infuriating, as the computer doesn’t like to cooperate. At least with another player you can try and coordinate hits back and forth. Knockout Challenge allows you to play single player or with an amiibo to level up a character’s skills. This mode reminded me of Street Fighter II, where you battle each competitor and move onto the next. It’s kind of cool that you can level up an amiibo to play doubles, but the idea has already been done with Smash Bros. and to me it didn’t seem very rewarding or worth my time. I’m also surprised that there aren’t any motion control options here. 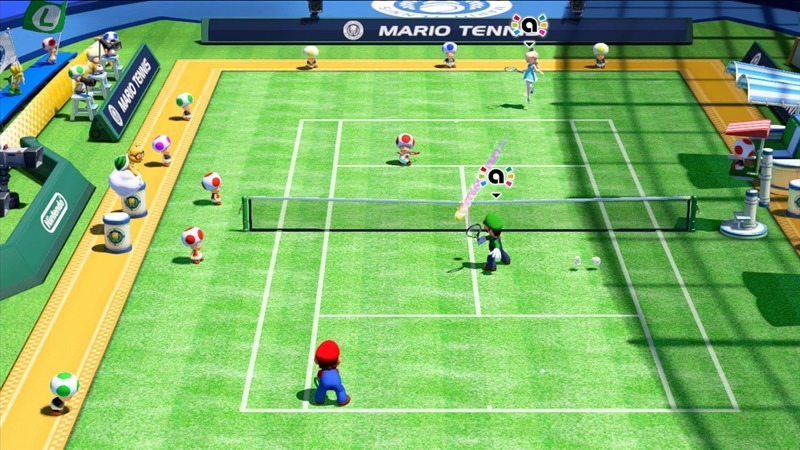 I’m not saying the game needs them, nor am I docking any points off for excluding them, but it does seem like the game would be a perfect fit for the Wii Remote’s gyros, especially when playing straight up Classic Tennis. Also, would it kill Camelot to throw fans a bone and include a full RPG mode in the console versions of their sports titles? Some of the most memorable parts of the portable Mario Tennis and Mario Golf games on the GBC were the RPG elements, and yet they refuse to implement that type of system via the console releases. It makes no sense. 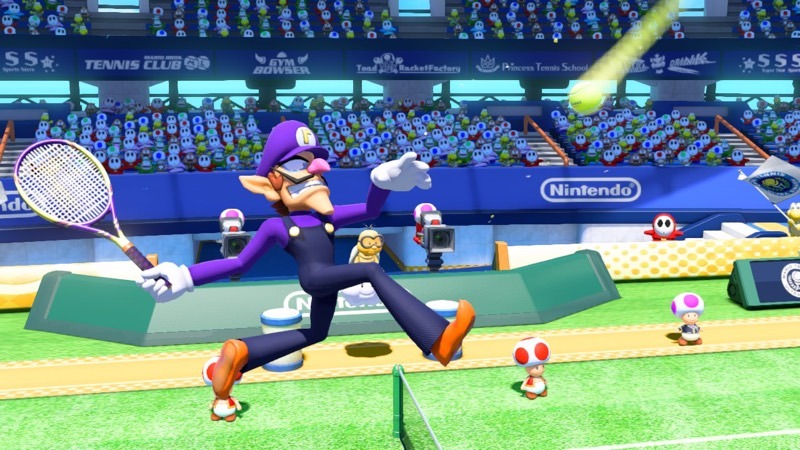 Mario Tennis Ultra Smash feels like it was rushed to the market to fill a void in the Wii U’s holiday lineup that was left by Zelda and Star Fox Zero being pushed into 2016. In all honesty this game should have been delayed as well, but Nintendo was probably under immense pressure to have a holiday title on store shelves before Black Friday – the official kickoff of the all-important Christmas shopping season. It’s a shame as this game could have been so much better with more time and resources spent on it. To be clear, Ultra Smash is fun to play under a narrow set of circumstances, but the potential for a much better experience is painfully obvious. When making a sequel, it needs to outperform its predecessors, not wallow in mediocrity hoping to skate by on brand recognition. Some people will be happy with this release, but I feel it’s a game that desperately needed more time in development to deliver a feature-rich package that this franchise deserves. Ultra Smash isn’t a horrible game – just mediocre. It lacks the soul of prior games in the series and doesn’t follow through with any of its new ideas. There is fun to be had here, but it gets tiresome far too quickly. Lack of fun courses, exciting items, robust online mode, and total disinterest in offering up an RPG mode make Ultra Smash a maybe-try instead of a must-buy.